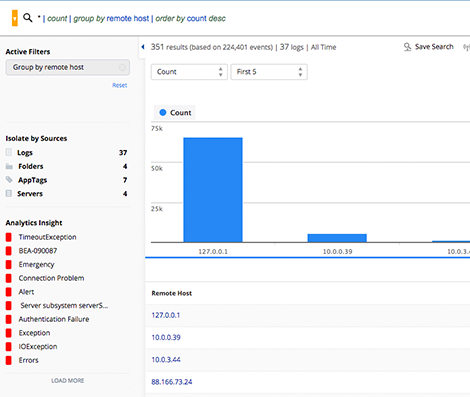 Log monitoring as a service for IT and Apps. XpoLog is a cutting-edge analytics platform, easily integrated with any cloud service provider. Amplify your IT Operation services, Cyber Security Analytics, Log Search and Monitoring, Compliance Reports, with XPLG as a Service. Add services to your cloud infrastructure. Add XpoLog to your infrastructure and deliver ultimate, variable, ITOA services to your end users. Our flexible MSP model, along with out-of-the-box added value and premium technology, bring real value from day one. XpoLog Log Management as a Service. Customers and partners provide XpoLog log management as a service to leverage our in-depth technology and benefit from excellent value. We excel in security, statistics, monitoring, and more. XpoLog license pricing model is based on Data volume analyzed per day. Amplify your IT Operation services, Cyber Security analytics, Log Search and Monitoring, Compliance reports. Customers will purchase on going pay as you go plans for monthly, quarterly or annual service.